Honestly, I made pancakes so that I would have one more way to eat strawberries. Strawberry season is in full swing in DC, whereas in Wisconsin I would have to wait until June for my favorite food. Growing up, the only thing that would get me out of bed early was strawberry picking. Before the sun even came up my mom and I would be at the strawberry patch to pick buckets upon buckets of berries. A couple years ago I also picked a dozen buckets with my dad to make into jam for wedding favors. (Note: Jam for 200 guests is a LOT of jam.) I like my strawberries. And I will never tell my parents what I pay for strawberries in DC. Technically though this is a recipe for pancakes. Some people seem very particular about their pancakes. But this here is my favorite recipe, and so I wanted to share it with you. It’s slightly adapted from my godmother’s recipe. When I was young my second home was at my godparent’s house. I spent countless hours running around outside there, having movie nights, and if we were lucky, pancake breakfasts. There was always something extra delicious about my godmother’s pancakes that we could never quite place a finger on. Then I stumbled across the recipe in my great-grandmother’s cookbook: Saturday Morning Pancakes, by Fred & Deb Bohl. Gotcha. There are two main factors in what made those pancakes so good. One is that the milk was fresh, as in straight from the barn. Since I can’t exactly go out back and milk a cow in DC, I sadly cannot replicate this factor. (Skim milk works just fine!) But the big recipe surprise is that there are no eggs! 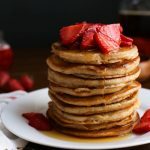 The pancakes are still light, fluffy, and turn out delicious and oh so comforting. It’s really about eating more strawberries, remember? 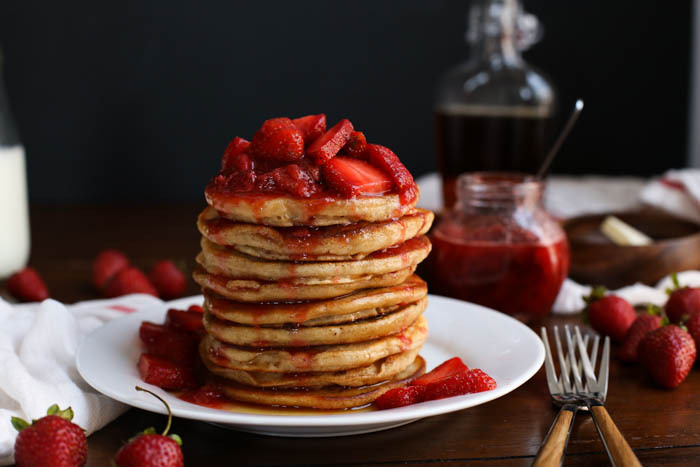 I’ve also learned that you can make pancakes a teeny bit healthier by substituting some of the regular flour for whole wheat flour (more fiber), and by using low-fat dairy (unless you can get that fresh stuff – Aunt Debbie will you ship me some?). Fruit and yogurt also add their own health benefits as toppings for pancakes. 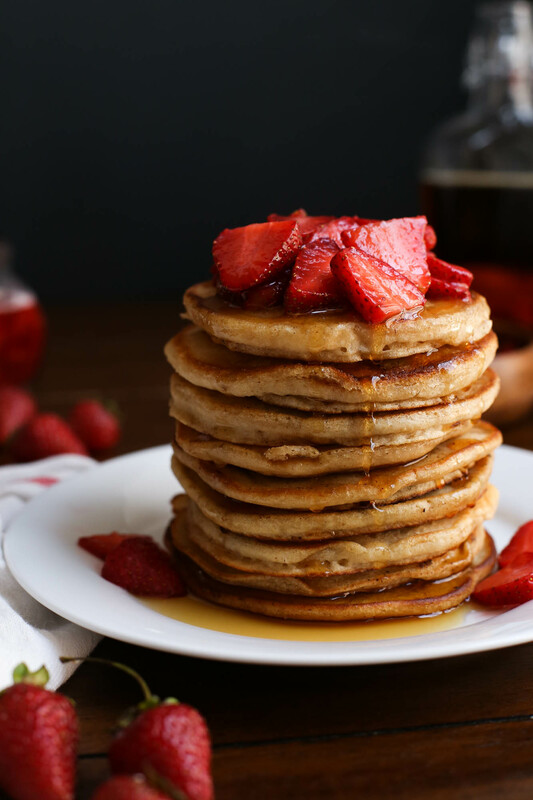 Mainly though, a tall stack of pancakes is about sharing slow, relaxing breakfasts on weekend mornings. On a side note: You may have noticed the posts slowing down a little around here. June is a bit crazy, so instead of three posts during the week it’ll be closer to one or two. I’m focusing on behind-the-scenes work a little more this month, and also get to go to the UK for 10 days at the end of June. I’ll still be bringing you delicious recipes, with more in July, so stayed tuned! For the strawberry syrup: Place the strawberries, sugar, lemon juice, and water in a small saucepan. 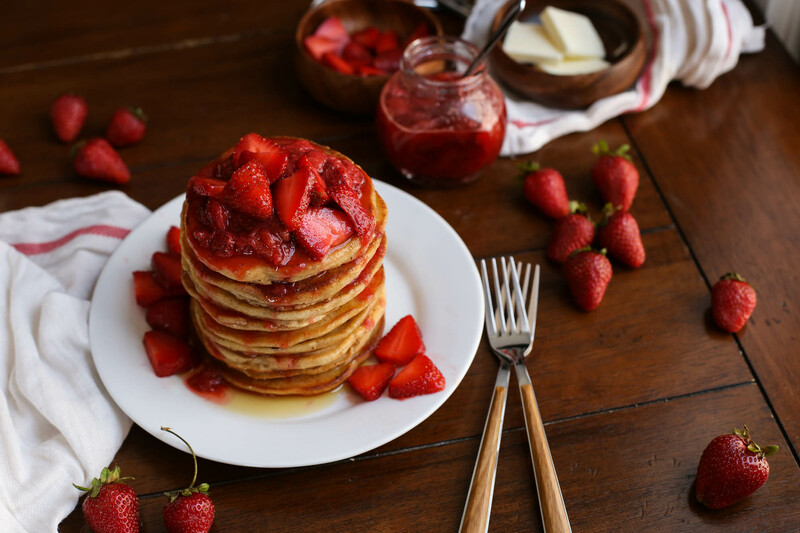 Bring to a simmer and cook for 10-15 minutes, stirring occasionally, until the syrup is slightly thickened and the strawberries have broken down. Set aside. For the pancakes: In a large bowl, whisk together the brown sugar, oil, baking powder, vanilla, and milk. 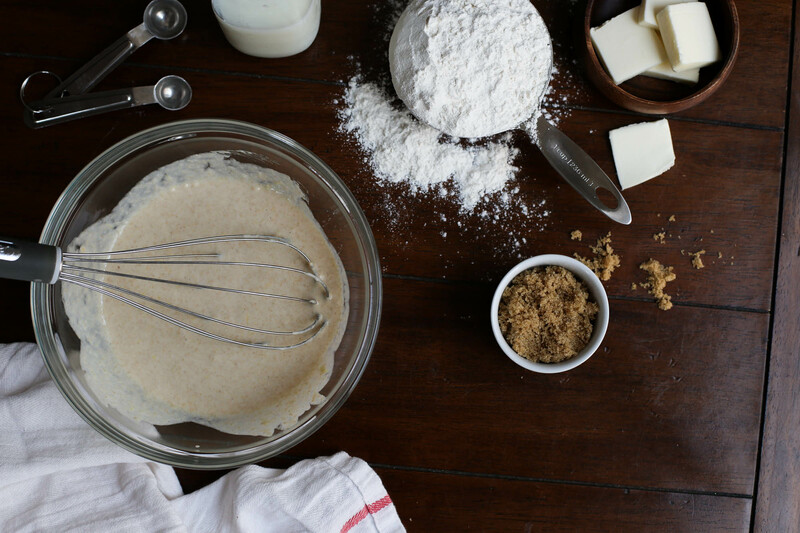 Add in both kinds of flour and whisk until just combined, being careful not to overmix. Let rest for at least 10 minutes. Coat a griddle or skillet with butter or cooking spray. Pour ¼ cup of batter onto the heated griddle and cook each side until lightly browned. 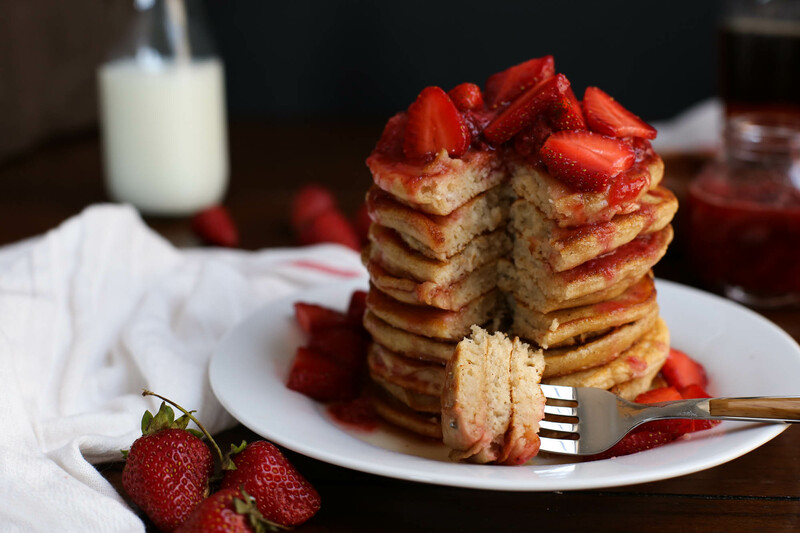 Serve immediately, topped with strawberry syrup if desired. The strawberry syrup is good served with maple syrup as well; strawberry syrup is less sweet.